I needed some excuse to make ink exercises. So I'm combining character design, humor and will be sharing what I've learned during these past years on HOW TO have IDEAS. 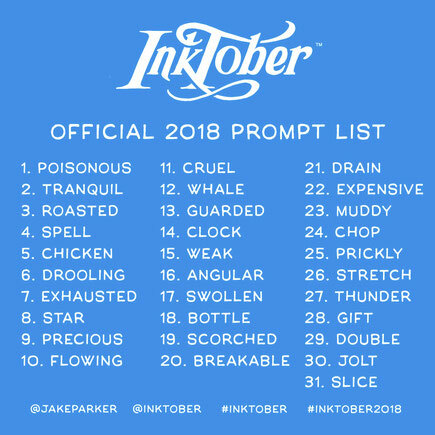 I'll be loyal to the #inktober2018 prompt list but I'll keep the same theme for all entries, making the words adapt to IDEAS and how to have them, find them, cultivate them or catch them all! Let's get it started! See you tomorrow on instagram @vanessabettencourtart! "Every October, artists all over the world take on the Inktober drawing challenge by doing one ink drawing a day the entire month. Created by Jake Parker. Note: you can do it daily, or go the half-marathon route and post every other day, or just do the 5K and post once a week. Whatever you decide, just be consistent with it. Inktober is about growing and improving and forming positive habits, so the more you’re consistent the better." Click if you want to find more about my upcoming activity book that will keep those ideas flowing, help you start, continue and finish a project. Subscribe to get a free pdf sample of the book and activities in your email soon. These tips and activities apply to more than drawing or writing.